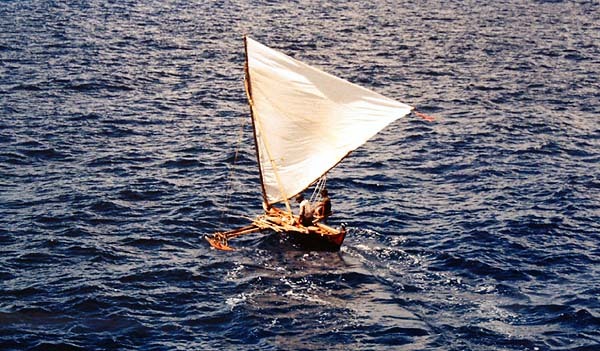 A canoe from Satawal negotiates the wind and swells. Photograph by Benigno Sablan. “When planning to travel," Steve begins, "the navigators go out at dawn, at sunrise, to the Eastern part of whatever island they are on, so that they can watch and observe the East. As the stars start to rise in the East, they watch the stars. If there is a particular stormy star that has risen, then you know it may not be a good time of the year to travel." "Usually from January to March, those are the calmer months for travel. On to May, then the weather starts changing, because the wind will be shifting around. So when you plan to travel, depending on the destination, whether it’s a farther place or a closer place, you observe the East early in the morning—observe the clouds. “If the clouds happen to rise in the East rather quickly, you know it will be windy, and if you see huge clouds rising in the East, then you observe it. And as the clouds rise in the East and they start branching out, then you have to observe it the next day. If it happens the same, then you don’t travel. "You keep observing the East. When you cannot find any more clouds—they are starting to clear in the East—you still have to observe again. This will take from 2 to 4 days, and if it’s still the same, meaning the East is clear, then you may travel." Wind on the beach at Falalop. “We have names in terms of direction. Due North that’s Yaengefaeng. Northeast, we have Hoodiyaefaeng, East we have Hoodi, Southeast we have Hoodiyooer, South we have Iyooer—that’s due South. Southwest we have Lodowaar. West we have L'odow, Northwest we have L'odowafaeng. “Old people believe that the northern wind is stronger because it’s higher, it comes down from the heavens. Southern wind is less strong, because it’s lower. But the Southern wind brings bigger waves. Because it’s higher, the Northern wind seems to be pressing down from the heavens and because it’s lower, the Southern wind is considered less strong, it only brings more waves." “We learn about wind from the old-timers," Mariano says,"and also we have experienced it. We have terms for different degrees of the wind. For example, a good breeze, we say yaengfilfil. That’s just a breeze. 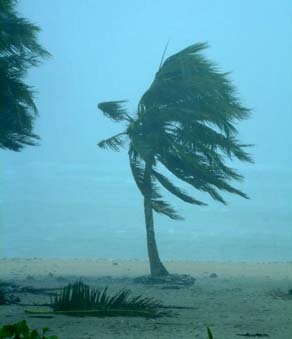 Semi-severe winds during a short-lived "banana typhoon." Afterwards, people came out to collect the downed coconut fronds for thatching. Ulithian Calendar, as dictated by Mariano and with input from Steve. "We have two seasons: summer and fall, " Mariano continues. "We call Fall Lliifaeng, and summer is Lerreg. Lliifaeng is considered to be a rough season. The term lliifaeng , the first syllable of liifaeng comes from the term li meaning to kill. Now, Lliifaeng means ‘to kill those months of that season.’ In other words, to kill it to get it out of the way, so we get to Lerreg, and that’s the calm season. Lliifaeng is the rough time of year, in terms of rain, wind and sea. All is rough." "The name of the summer season is Lerreg. This refers to a peaceful, calm time, also plentiful of fruits. 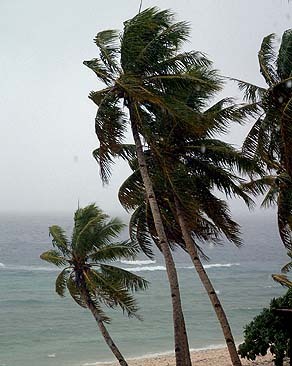 Breadfruit, bananas, including fish, because you'll be able to get to most fishing grounds, since the water is calm." "It was according to the months of the year, each year. See, after July, as August approaches, the wind shifts to the West and the sea starts getting rough. And that will go on from about August to January, February and March, then it starts getting calm again. Meaning you’re entering the Lerreg season, or the summer season of the year. But it has to do with the months." “Summer, it goes to July," Steve adds, "so by August, the wind will shift out. So the Fall runs September, October, November, December, January. August through February is the Fall season, and summer starts March through July. These are the time that you should travel to these islands—March to July—because then you can get to other islands. You have good winds." After a strong wind, conveniently downed coconut fronds are gathered for thatch. Rough seas come with the strong winds in this October photograph. A 55-gallon drum has washed up on the shore where the boat is pulled up. "Starting in August—even sometimes it start late, July—the waves start to get big," Mariano says. "We can still travel, but you need a metal backbone! But in the old days in Ulithi, during the Fall season when the waves are really big, that’s when they say it’s trolling time. And people go out to troll almost every day. "They can troll around the lagoon. And they keep on doing that, if they don’t catch today, they still go out tomorrow, if they catch a lot they still go out the next day. Because it is said that this is the time, Fall season is the time for trolling, because you have good winds." "During summer, the wind can come from the West, Southwest, or South," Steve continues, "but you just barely notice it, it’s so calm. When it start coming stronger from the West, you know it’s the beginning of the Fall season. The strongest wind from the West, that’s the start of the Fall season. "And the wind, as it shifts to the East, it never goes the Northern way. No, if the wind is shifting around, before it moves up there to be stationary in the East it could go up Northwest. Sometimes it goes North, but not over to the East that way. It has to come through the South. When it’s coming that way, then you know it’s going to move up to the East. So when the wind starts moving around to the South, then you know it’s going to go up to the East and stay there." “As the wind comes from the south, southwest,” Mariano notes, “then this island (Falalop) gets rough—all the sea around this island is rough. If the wind goes easterly, or northerly, then it’s okay here. For other islands, perhaps it could be different because of the location of each island. 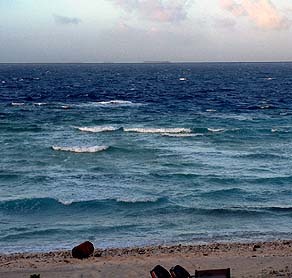 The sea getting rough on the lagoon side of Falalop. Storm clouds over the Northern reef. 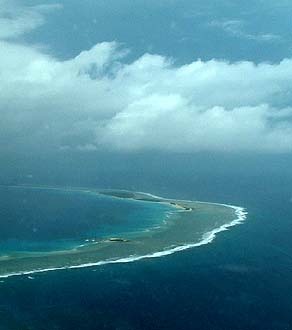 “How strong the wind is on this island and that island, these are very small islands. So it’s almost the same everywhere. We don’t have hills here to make our wind come down this way and really hit on this island here, no. It’s all flat islands, in terms of wind. 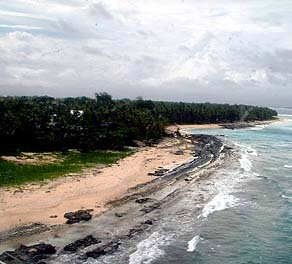 “But for the whole Ulithi atoll, if a storm is approaching and the wind sticks to the north, they know it’s probably coming our way. As it changes either easterly, westerly and to the south, they will know it’s probably passing us. From the north, it’s going to hit. "So the wind that right now sticks to coming from the south, you can simply interpret it as a, probably a thunderstorm has passed us. So this is probably the tail of it. In one or two days it’s going to calm again." 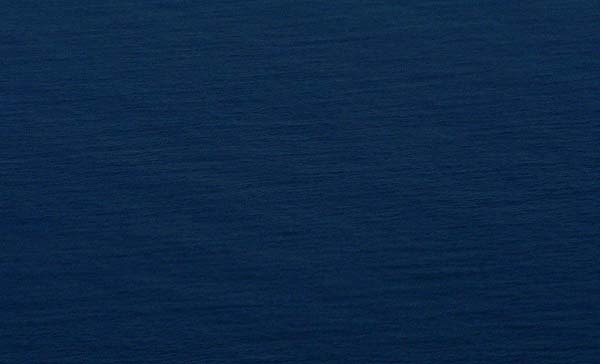 Swell on the open ocean makes discernable patterns, visible here from the air. The navigator must know these intimately, so that he can find his direction in any type of weather. "Now in terms of swell, there is a roll that usually comes from the East—East we call Maaeylaep—and we say, ‘the swell that come from Maaeylaep,’ meaning this Eastern swell is coming now. And the Western wind usually brings the waves, breaking waves. "We also have the swell from the north, from Welwel. So that’s how we know directions at sea, even though we are not using a compass: we can tell that this is the swell coming down from the East, from Maaeylaep, and this is swell coming down from the north, from Welwel. The swell coming down from the north, Welwel, it’s on top of the swell coming down from Maaeylaep. "The Maaeylaep swell—the East swell—is bigger. So even at night, in the dark on the open sea, you can still tell these swells. If you’re coming down from the East going toward the West, the swell from Maaeylaep is coming from the back of you and swell from the North, from Welwel, should be beating on the side of the canoe." "Those who know these waves," Steve concludes, "they know the difference. Even though there are only two types of swell that we know of, it’s not going to be easy for whoever doesn’t know anything about these two, the difference between these two swells. That’s why it’s really important to learn these kind of things." The mat stays open as our instruction moves from wind to rain.